Trust Story – A Master was traveling with one of his disciples. The disciple was in charge of taking care of the camel. They came in the night, tired, to a caravanserai. It was the disciple’s duty to tether the camel; he didn’t bother about it, he left the camel outside. Instead of that he simply prayed. He said to God, “Take care of the camel,” and fell asleep. If He wants to tether the camel He will have to use somebody’s hands; He has no other hands. And it is your camel! The best way and the easiest and the shortest, the most short, is to use your hands. 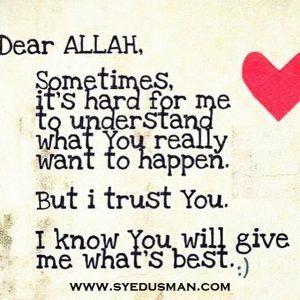 Trust Allah. Don’t trust only your hands, otherwise you will become tense. Tether the camel and then trust Allah.You will ask, “Then why trust Allah if you are tethering the camel?” — because a tethered camel can also be stolen. You do whatsoever you can do: that does not make the result certain, there is no guarantee. So you do whatsoever you can, and then whatsoever happens, accept it. This is the meaning of tether the camel: do whatever is possible for you to do, don’t shirk your responsibility, and then if nothing happens or something goes wrong, trust Allah. Then He knows best. Then maybe it is right for us to travel without the camel. It is very easy to trust Allah and be lazy. It is very easy not to trust Allah and be a doer. The third type of man is difficult — to trust Allah and yet remain a doer. But now you are only instrumental; God is the real doer, you are just instruments in His hands. Friendship Quotes – How Friendship Affects Your Life? Pingback: Inspiration Inspirational Story about God Knows What is Best for You. Trust God!